Department of Medicine offers training to the medical students of 3rd, 4th and 5th year MBBS course. 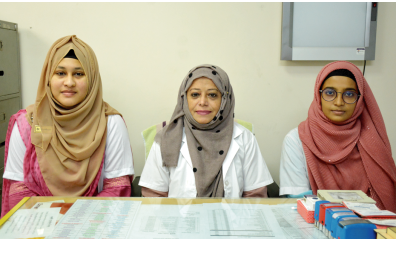 The main objective of the department is teaching the subject with a view to produce young doctors who will be acquainted with various methods and tools for diagnosis and treatment of common diseases, facing emergencies, referral to the appropriate place/person and also prevention of diseases especially the infectious and communicable ones. The allocation of teaching for the subject is 160 hours for lectures, 200 hours for tutorial, 20 hours for integrated teaching, 34 wks of clinical bed-side teaching and 4 wks for block posting. It is a news of gratification that BCPS the most commendable organization in postgraduate teaching have recognized the training, we are offering to the post graduate students for a period of one year. Department of Psychiatry offers training to the medical students of 3rd & 4th Phase. The main objective of the department is to teach the student who will be able to comprehend the concept of mental health in detecting common mental disorder, historical concept of psychiatry and its gradual development for appropriate management of patient in the community and deal psychiatry emergencies. Total allocation of teaching hours for the students is 20 hours for lectures in 4th phase and 3 weeks for clinical bed-side teaching in 3rd phase. * Outline the role of importance of Physical Medicine. * Identify the various modalities of Physical Medicine. * Plan to apply Physical therapy to certain clinical condition. Physical Medicine department offers clinical bed side teaching for two weeks in 4th year and 5 hours lectures for 5th year students. Department of Dermatology offers training to the medical students of 3rd & 4th Phase. The main objective of the department is to teach the student who will be able to comprehend the concept of Dermatology in detecting common skin disorder and appropriate management of patient in the community. Total allocation of teaching hours for the students is 20 hours for lectures in 4th phase and 3 weeks for clinical bed-side teaching in 3rd phase. Department of Pediatrics offers training to the medical students of 2nd, 3rd and 4th phase. The main objective of the department is to render training medical graduates who will be able to manage common childhood problems. Hence, at the end of the course, the student will be able to manage acute and common pediatric and neonatal problems at the community level, identify neonatal and pediatric problems that require secondary and tertiary care and refer them appropriately. Total allocation of hours for the subject is 50 for lectures and 25 hours for tutorial. Another 10 wks of clinical bed-side teaching is allocated for 2nd and 4th phase. 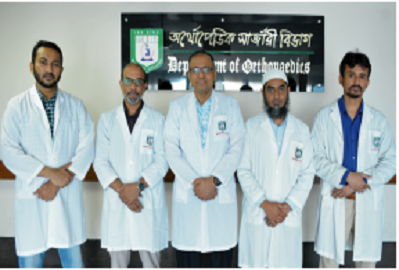 Department of Surgery offers training to the medical students of 2nd, 3rd and 4th phase and designed to offer understanding of the subject with a aim to promote and provide community oriented & need based education so as to produce basic doctors who will be able to diagnose common surgical problems prevalent in Bangladesh, carry out necessary investigations & interpret the results, perform minor surgical procedures and treat minor surgical problems, diagnose and provide competent primary care in surgical emergencies, carry out the responsibility of management in common casualties or natural calamities to offer and arrange basic life support, recognize the major surgical problems needing specialized care, initiate the primary treatment and refer to the appropriate centers. The Department of Orthopedic Surgery offers teaching to the students of 2nd, 3rd and 4th phase. The main objectives of the department are to render teaching of the basics of the subject with a view to train up students to deal with the Fracture Immobilization, Reduction of Dislocation, surface Traction and surgical toileting etc. Students are taught in lecture classes, Tuotorials, in patient clinical round and in Operation Theater. The department deals with Trauma and Orthopedic patients of wide range. Here routine trauma cases with specialized cases like Arthroplasty, Spine cases and other Reconstructive Orthopedic procedures are also being performed. Students have unique facilities of observing these advance orthopedic surgeries in their undergraduate course. Department of Transfusion Medicine offers teaching about modern concept of cellular and other component therapy of blood. It’s also offers the students to access the sea of knowledge about how to optimize the supply of blood and its components, their safe and rational clinical use and maintaining quality, effectiveness and efficiency of blood and components. Hence at the end of course students are able to select donor, phlebotomy procedure, manage any complication during the procedure from blood collection to transfusion and also able to know when a patient or blood sample is to be sent to referral center. Total allocation of teaching hours for students is 05 hours for lectures and 1 week for clinical teaching in third phase. Department of Radiology & Imagins offers training to the medical students of 2nd phase (3rd year) & 4th phase (5th year). Radiology & Imaging deals with diagnosis of different diseases related to Surgery, Medicine, Gynae & obs. patients with the help of different types of imaging modalities e.g. x-ray (including contrast x-ray), Ultrasonography, CT Scan & MRI. Students are able to understand the principles of Radiology & Imaging, to appretiate the importance of imaging as investigations, diagnosis of clinical conditions, to understand the hazards of radiation. Total allocation of teaching hours for this subject is 05 hours for lecturers for 5th year students. Placement of 3rd year students for 1 week in Radiology & Imaging department. Department of Anesthesiology offers training to the medical student of 3rd & 4th phase. The main objective of the department is to teach the student who will be able to aware of safety in anesthesia, aware of the possible complication and management, demonstrate basic knowledge of cardio-pulmonary (CPR) and describe the scope of anesthesia in rural environment. Total allocation of teaching hours for the subject is 10 hours in 3rd phase, and 1-wk clinical bed-side training in 4th phase. Department of Otorhinolaryngology offers training to the students of 3rd and 4th phase by theoretical, practical and clinical teaching. 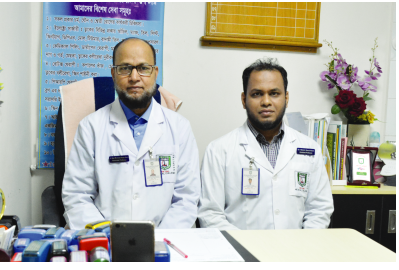 The objective of the department is to produce community oriented doctor with basic knowledge of common diseases of ear, nose and throat with their emergency management. The allocation of teaching hours for the subject is 40 hours for lectures and 4-wks & 4-wks clinical bed-side training in 3rd phase & 4th phase. Department of Ophthalmology offers training to the students of 3rd & 4th phases of MBBS curriculum. 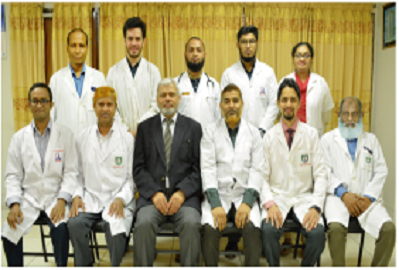 The main objective of the department is to provide community oriented and need based education to produce a doctor with good basic knowledge of ophthalmology who will be able to diagnose, treat and manage the common ocular ailments, provide leadership in the sphere of primary eye care, diagnose and provide initial management and refer ocular emergency cases appropriately. The allocation of time for teaching for the subject is 40 hours for lectures and 8-wks for clinical bed-side training in 3rd and 4th phase. Our department is well equipment with modern machineries. We have special audio-visual system at operation theatre and outpatients dept to show the trainees live surgery and details of OPD patients. 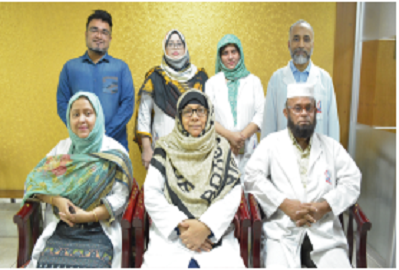 Our department is recognized by BCPS (Bangladesh College of Physicians & Surgeon) for the post graduate Fellowship training program required for FCPS Examination. Department of Gynecology & Obstetrics offers training to the students of 3rd & 4th phase and is designed to offer an understanding to the subject with an aim to produce a basic doctor with community based training so as to provide an effective health delivery system suitable for our country and for effective solution of our problems e.g., over population, high maternal morbidity and mortality, high perinatal morbidity and mortality, malnutrition, illiteracy and superstition and low socioeconomic condition. They should also be able to recognize and refer the critical cases to proper authority. Total allocation of lecture is 200, 8-wks & 8-wks of clinical bed-side teaching in 3rd phase & 4th phase. In addition, 4-wks of block posting is scheduled.